Princeton, New Jersey is famous for its world-class university, and both students and longtime residents enjoy the full expression of each of the four seasons here. The outdoor temperature peaks in July with an average of about 85 degrees, and then it dips below freezing in January. Spring and fall are the more moderate seasons, featuring mild and comfortable weather. The extreme shifts in temperature, however, mean that pest problems are common in Princeton. Warm, humid summers create the perfect conditions for disease-carrying mosquitoes to proliferate. Wildlife pests reproduce and can carry rabies and other diseases. Spiders and insects will move into houses to get out of the cold when temperatures drop outdoors. Here are a few of the pests that pose problems for the businesses and residents of Princeton. More than 25 species of ants are commonly found inside homes in the United States. The species that plague New Jersey residents include odorous house ants, pavement ants, and carpenter ants. Odorous ants emit a foul-smelling odor when alarmed or crushed. They often build nests inside walls and can be active in the winter as well as summer months. Pavement ants create the small mounds of dirt you’ve seen on sidewalk cracks. However, they can be attracted to homes in search of food and moisture. Carpenter ants destroy wood when they build their nests. Rodents amp up their home invasions when the weather gets colder. House mice, roof rats, and Norway rats are drawn into the warmth and comfort that’s found inside homes and businesses in Princeton, New Jersey. Once they get inside, they can destroy food and property, and they are potential carriers of disease. Rodents can multiply very quickly. It’s important to take action to remove an infestation at the first signs of rodent life inside your home or business. A professional pest control company has effective ways to get rid of rodents and keep them from returning. Termites can easily enter any building because they can fit through a space that’s only 1/32nd of an inch in size. They’ll take advantage of openings in cracked concrete or around plumbing penetrations, typically swarming to new areas sometime between summer and late fall. Termites destroy any material that contains cellulose, including wood, wallpaper, books, drywall, and furniture. Termites are small insects with a pale appearance, and they leave behind small, bun-shaped droppings. Pin-sized holes in wooden surfaces is a sign that you may have a termite problem. Since it can be tough to assess the severity of a termite infestation, it’s wise to call a professional pest control company. They can create a safe and effective plan for eradicating these pests. If you're in Princeton and you think you’re dealing with an infestation, give DB Pest Solutions a call today. 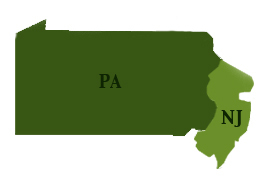 We’ve been eliminating and managing pests in New Jersey for 30 years. Using the latest techniques in pest control, we can provide a fast and customized solution to your pest problem.